Fig. 24. St. John's wort. St. John's wort (Hypericum perforatum L.) - wild entered into the culture of the plant. Active substances - flavonoids. From the grass zveroboja receive antibiotic novoimanin. In a 1% alcohol solution and ointment is used as an external tool for the treatment of wounds, burns, ulcers, abscesses, mastitis, rhinitis, laryngitis and sinusitis. Oil extract from herbs recommended for the treatment of trophic ulcers. Extract (10 : 200, 1 tablespoon 3-4 times a day) apply colitis, tincture (30-40 drops on % Cup water), for gargling gingivitis, stomatitis and for lubricating gums. Tear the sheet St. John's wort and examine it in the light. It transparent dots scattered, and the edges are decorated with black spots. Spread sheet fingers - they will become yellow. This point-iron stands out caustic essential oil. In the light of a piece of iron and seem holes. Now RUB the flower in his hand. If stained fingers in purple color, then you really saw the famous green healer and miracle herb luchshuyu from 99 diseases. The distinguishing signs Hypericum perforatum. Hunters many kinds, but only need to collect St. John's wort, or as it is otherwise called, ordinary. There is St. John's wort tetrahedral, with four longitudinal sharp edges on the stalk. St. John's wort rough stands out from his family stalk, downy soft hairs sticking out. On the territory of our country grows 51 species of Hypericum, and all its features. Flashing yellow flowers of St. John's wort on forest edges, glades, among bushes, on dry slopes. It can be seen near the roads and fields, on the cuts. Big thicket St. John's wort does not form. Bloomed the first flowers - it is time to build a medicinal plant. Cut only the top 25-30 cm long, trying not to damage the roots, because the plant is a perennial. Thickets Hypericum you want to save. It has long been considered the main medical grass. " As no flour can not bake bread, so without Hypericum you cannot treat many diseases of people and animals, " say the healers. Justly famous St. John's wort for its healing properties. Earlier, whatever the mixture of herbs from whatever illness nor was it necessarily included. Interested scholars such popularity of St. John's wort. Studied it. And now he has entered in scientific medicine. Retrieved from St. John's wort preparation "Novoimanin" is used as an antibiotic in the treatment of purulent wounds, ulcers and burns, helps with tonsillitis, sinusitis and tonsillitis, diseases of the ear, nose. 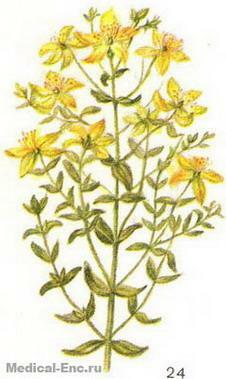 Water and spirit tinctures of St. John's wort is used for rinsing for diseases of the oral cavity. In folk medicine it is often used in the form of complex mixtures with other herbs in so many diseases. Such a diverse effect of Hypericum on the body easily understandable, given that the plant contains dozens of physiologically active compounds. Here and tannins, vitamins, carotene and various trace elements. And why is it called St. John's wort? It turns out that if a white cow or a sheep will eat a lot of grass zveroboja, they get poisoned. On ears, around the eyelids and mouth swelling appears. On the skin cracks, ulcers, which are very itchy. Animals are itching, bad eat, lose weight. They have a fever, jaundice appears. But stand up for some time a sick animal in the dark barn - and everything goes. Veterinarians have long known the ability Hypericum dramatically increase the sensitivity white animals to sunlight. Probably, here comes the name of grass. That is why in places where a lot of growing Hypericum, go cows, sheep and even pigs dipped in dark paint. Blossoms St. John's wort from June to August. For the seeds you can go in the first half of September. St. John's wort is a plant of many years, and one site it is possible to grow up to 5 years. For his late autumn sowing area have to dig, to the time of planting , the soil has had time to settle; to spring the soil is prepared in the fall and spring only harrowing. St. John's wort is good responds to organic and mineral supplements. Digging make 3-4 kg of manure and peat compost or 2-3 kg of manure and 10-15 g NPK per 1 m2. If no organic fertilizers dose mineral double. Before winter it is possible to dry sow the seeds, not closing up their soil, the distance between the rows should be 45 see For spring sowing the seeds need to be stratified for 2 to 3 months. They are mixed with sand, slightly humidify and kept in the refrigerator at +5 degrees. Can seeds placed under the snow. Shoots the late autumn sowing appear before the spring for 2-3 weeks, there are more dense and develop better. First, they are very small and grow slowly, so you should regularly their weed, and loosen the aisle. For the season do it 3-4 times. In 1.5-2 months after germination of plants should feed the NPK (5 to 6 g per m2). In the following years, the fed's wort in early spring and after the first harvest. In the first year of life he did not bloom.